If you've got someone on your Christmas list who's tough to buy for consider a nice, personalized Zippo - get it engraved. A Zippo lighter always works - even in wind and rain! You'll find this illustration and a couple of others in my James Dwyer Flickr set. 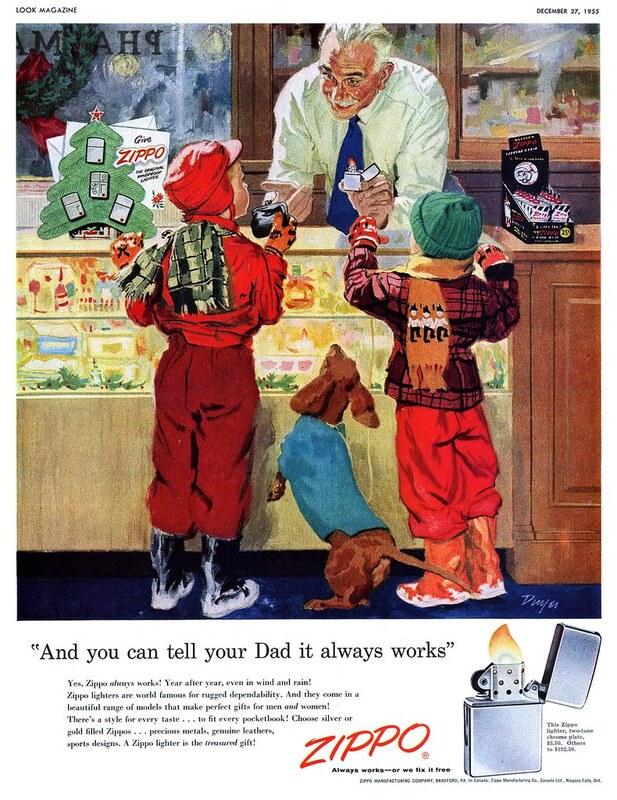 That's great Leif...I love ads promoting selling fire to children. Or better yet, they have the first part of their smoking career secured. Yes indeedy, Shane - weren't the 50's the best? I've got a fantastic companion ad where, as a sleepy-eyed dad comes down the stairs for breakfast, mom n' the kids are greeting him... with a carton of smokes! Truly, it was the best of times, it was the worst of times! That's real cool collection of Christmas postings!! THanks for sharing these! And thanks for your comments, Alina - both here and at leifdrawing101! Gee - Do you think they'll have enough money left to buy dad a pack of smokes, too? How much were smokes back then... 10 cents? 25 cents? I should hope that they bought poor day at least one pack of smokes. My dad used to adore those engraved zippos. He loves giving them as gifts to his smoking friends. Good post on the Zippo Lighters! Personalized Zippo lighters will be a great personalized gift also.